June is super bright and breezy, so it’s perfect for travelers seeking Caribbean sunshine. I love how the infinity pool has the illusion of blending with the sea, and it’s so relaxing to watch the sailboats go by in the harbor. If you’d rather relax inside, there’s an amazing media room—it’s like your own private movie theater! Amazing views of Corossol and Gustavia Harbor!! June is a fully air-conditioned Corossol 6-bedroom villa with ocean views and contemporary design. This picturesque retreat offers a fully equipped kitchen, an impressive media room, and six chic suites. Designed to emphasize its gorgeous natural surroundings, June’s architecture frames the view and blurs the lines between the interior and exterior. The enormous sun deck features a large, infinity-edge pool that appears to pour into the harbor below. Guests can watch yachts and motorboats sail by from the in-water loungers or sun beds. Beautiful wood planks and unique nautical lighting hang over the veranda and shade the al fresco dining and living space. Wide sliding doors open to the Great Room’s large living room and kitchen. The living area has several plush couches and armchairs, a flatscreen smart TV, and eclectic trinkets amongst a backlit bookshelf. The kitchen is a few feet away and has a large center island, a breakfast bar, stainless steel appliances, and a farmhouse sink. June’s six suites are each equipped with a flatscreen Apple TV, a DVD player, amazing views, and large, private bathrooms. Five of the suites have king beds, and one has two twins that can be made up as a king. Two suites share a bathroom, and one suite has terrace access. This set-up is ideal for any range of groups: families, couples, or any combination of the two. Last but not least, there’s a home theater with ambient lighting, theater-style seats, and a projector screen. A housekeeper maintains the villa daily, excluding Sundays and holidays. 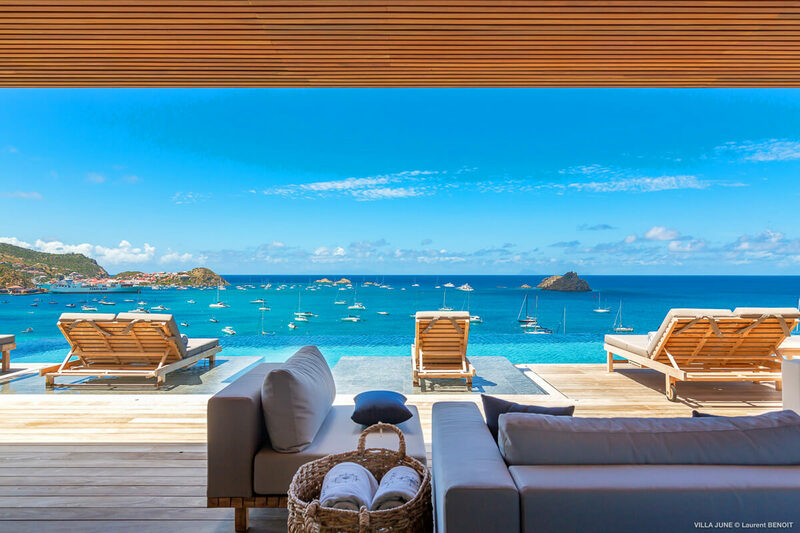 June is minutes from Gustavia, yet in its own world. Gustavia has several restaurants, bakeries, shops, and activities to explore, but there’s hidden gems all throughout the island. Approximate 2 minute walk to Plage de Corossol and a 7 minute car drive to Flamands Beach. Upon arrival guests will be met at the airport by a member of the villa management team. After securing their rental vehicle guests will follow them to the property.